Our story begins with a heavily pregnant village girl named Ranjana (Nirupa Roy) being visited by the father of her child, the local Thakur. Suspicion that all is not well rears its ugly head immediately when he tells her mother not to come, and his servant Rashid Khan’s smirk doesn’t help either. 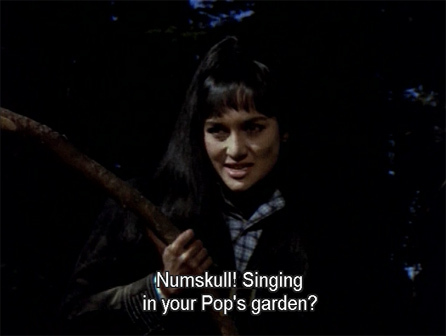 When the two of them take her to a remote part of the forest and try to kill her, it’s not really surprising. 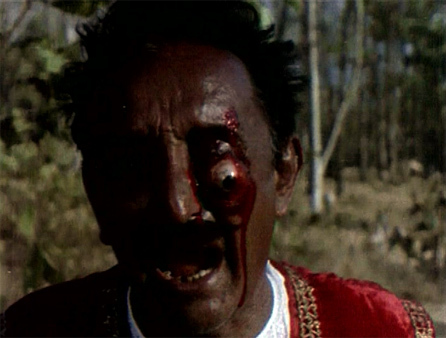 The Thakur slips on some rocks when she fights back, and falls to his death in the valley below. When Rashid attacks her, she hits him with a rock, dislodging his eye. 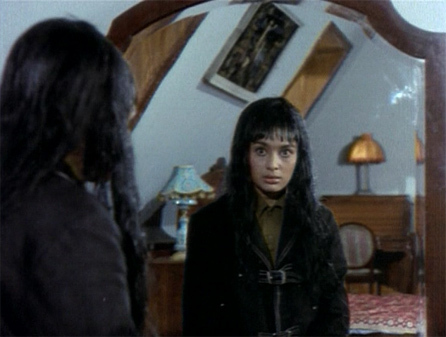 She is tried for the Thakur’s murder (Rashid lies on the stand) and sentenced to prison for 7 years. Her son is born soon after the trial, but when the kindly jailer brings him to her cell, she asks that he be put up for adoption; she wants nothing to do with him and the memories associated with him. The infant boy is adopted by wealthy Ramprasad Jain (Brahm Bharadwaj) and his wife, who name him Ajay, and bring him up with a lot of love. They send him off to boarding school to get a good education when he turns six. He bids farewell to his friend Bhola, the son of one of the family servants. When Ranjana’s sentence is up, she relocates with the help of the jailer. He has a friend living in the wilds of Himachal Pradesh with a little girl who needs mothering (his wife died in childbirth). Glad to get away far away, she goes to meet the man (AK Hangal), a timber estate owner, and his little girl who is growing up a wee bit wild herself. Soon after Ranjana arrives, her employer is killed by the men of a rival nearby timber estate, which belongs to Ramprasad Jain! Unaware that she now lives—and swears enmity with—the very people who adopted her son, Ranjana brings up Seema as the heir to the estate and is herself called Rani Maa. That evening his parents take him to the Silver Jubilee party at the Planter’s Club (it’s veddy veddy British, and lots of phirangi tourists were recruited to fill in as guests). There, he is introduced to one of Jain’s best friends, Mr. Saxena, and his wife. They have a beautiful daughter named Rita (Helen) who has also recently returned from abroad, and both sets of parents nurture the fond hope of getting Rita and Ajay married to each other. She has opened a dance school in the area, and performs with her students at the Jubilee celebration. Ah, how I love Helen. 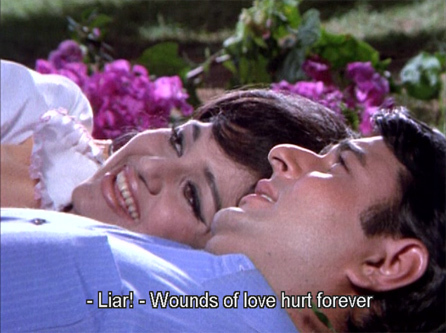 And this is one of my favorites: “Naach Ae Dil” (Shankar Jaikishan are the music directors). She has become quite westernized, though, and Ajay has remained a simple Hindustani with simple tastes, as a good hero should. Her flirting doesn’t really interest him, but she is quite smitten. 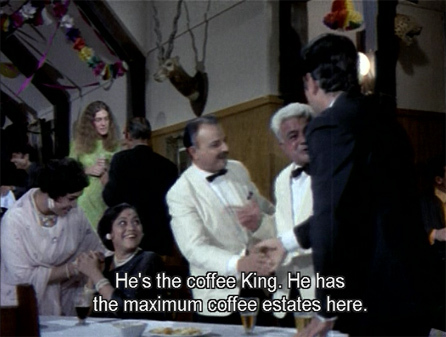 The next day, Ajay’s father surprises him by saying that he wants to sell the estate: it’s been losing money because of their competitor and neighbor, Rani Maa. Since Ajay’s education has been all about timber estate management, he is reluctant to give up so easily. He tells his parents that he’ll go and stay with the workers, anonymously, to find out what’s going on. They agree reluctantly as long as Bhola goes with him. 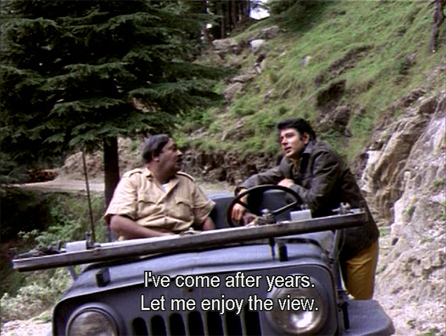 Ajay sends Bhola ahead, and sings a song about the spectacular scenery. He stops when he’s hit on the shoulder with a stick. Turning around, he sees a wild-haired, dirt-smudged hoyden glaring at him. It doesn’t look like Seema has changed all that much since her tomboy childhood days. I love Asha in this role. She is hilarious and really seems to enjoy letting loose. 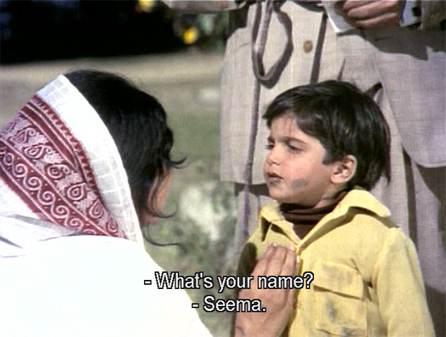 She tells Ajay that her name is “Jantar Mantar” and he tells her that he is Ramesh, Bhola’s nephew. When he describes her to Bhola later, Bhola knows instantly who she is. 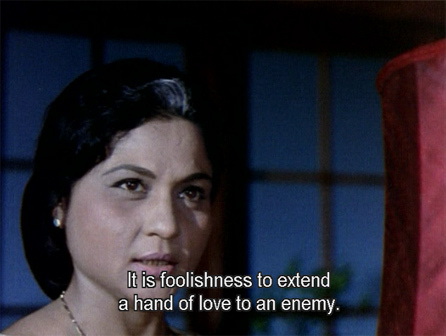 Rani Maa runs Seema’s estate with an iron fist and no empathy or kindness whatsoever. Life has made her a bitter, unhappy woman who only cares about turning a huge profit and continuing the long-standing feud with Jain. She’s got no control over Seema, however, although she wishes she would grow up, calm down, and take some responsibility for her inheritance. Things are about to change drastically, however. Ajay discovers that the estate manager has been mismanaging it on purpose—he’s in Rani Maa’s pay. He also sees how little the workers earn, and how they don’t even have basic necessities like blankets for the cold. He fires the manager, gives the workers a raise, and buys the things they need for their homes. He also upgrades their production tools and techniques, streamlining the business for better profits and a safer environment for the workers. Morale soars. Meanwhile, Ajay keeps running into Seema (literally! their jeeps collide head-on several times). Her somewhat dubious charms attract him and he devotes a good deal of time to teasing her. 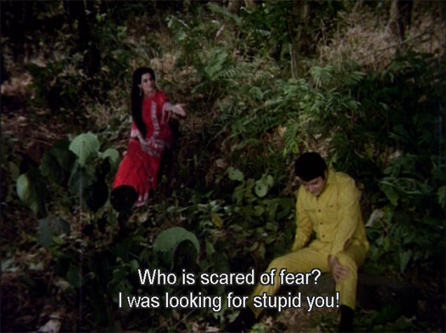 He also approaches Rani Maa, hoping to put their enmity aside, but she rejects that idea. One day Seema falls from a tree into a large pool where Ajay is enjoying a swim. He pulls her underwater and kisses her; when they emerge, she is speechless for once in her life. She asks Rani Maa to help her with clothing and makeup, and sings a lovely song, “Bol Nadaan Dil Tujhko Kya Ho Gaya,” as she revels in her newfound love and womanhood. but Ajay is charmed completely. Their romance blossoms sweetly apace, but of course trouble looms ahead. Ramprasad Jain has promised Saxena that Ajay will marry Rita, and he still considers Rani Maa and Seema the enemy. Rani Maa, displeased with everything as usual, discovers that Seema is in love with Jain’s son, although Seema still thinks he’s just a simple worker. Her estate manager, Manglu (Madan Puri) is scheming to marry Seema himself for her property, and Rani Maa’s past comes back to haunt her. What happens next? Can Ajay go against his beloved parents? 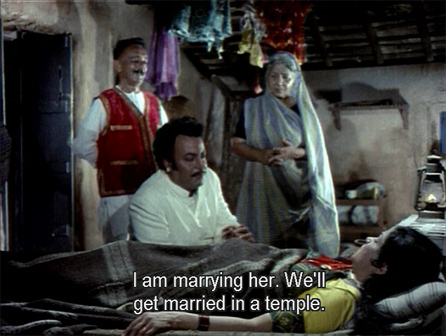 Will Seema even want to marry him when she discovers that he is the enemy? Will Rani Maa ever discover that Ajay is really her son? Or will Manglu’s evil machinations ruin everything? Watch Nadaan to find out! It’s comfort food in movie form: satisfying, not necessarily nutritious, but deee-licious all the same. Posted on September 14, 2008 at 12:58 pm in Excellent Use of Helen, Hindi movies	| RSS feed You can skip to the end and leave a reply. i don’t think i could watch this movies, as my nickname in school was numskull, how rum and num sound the same is beyond me. asha looks gorgeous here, and helen’s item song is great and rollicking! 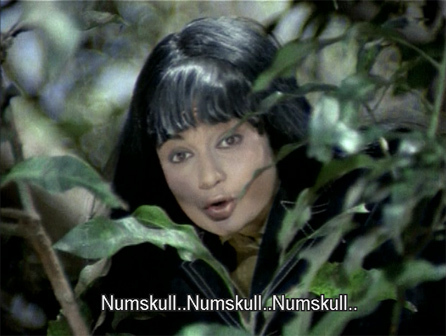 Well, she doesn’t SAY numskull, she says “saala” and it’s really a lot of fun. Is your name really Rum??? This sounds delightful! With a dash of workers unite! Is it me, or does Helen look a teeny bit old in that still? Weird because she was still foxy in films made much much later. 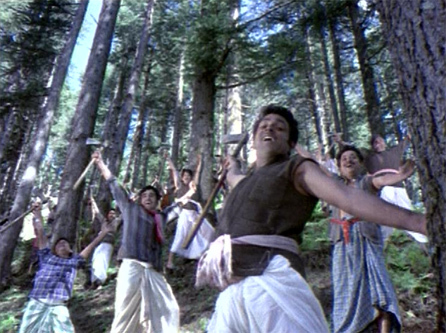 Haven’t seen this one but I have an odd fondness for Bollywood movies set in forests – hijinks always ensue! It really is delightful. I love the message (your basic “Do unto others…”), I love hilarious Asha, Navin is lovely and Helen doesn’t look old, she is quite beautiful in fact. Yes, forest=fire, molesting of women, sweet romancing…all of that is present here! my name is Rumnique, but everyone uses nums or numskull! I don’t think I’ve seen any complete films from the sixties yet. Hindi, I mean. Seeing as you’re so fond of the decade, maybe this would be a good place to start? For someone who knows 50’s and 60’s Bollywood pretty well (and that extends to about 1972-3 too), I’m a bit embarrassed to admit I’d never even heard of this film! But anything with Asha is all right with me, and I rather like Navin Nischal too (Buddha Mil Gaya, Victoria #203 and Dhund are firm favourites), so am definitely adding this to my list of must-sees. Thank you for the delightful review! I haven’t seen this one at all, not even the songs. Looks delicious. Am going to GET it. O Wow! Naveen Nischol doing what he did best – look super good – and some great songs too. Not too sure about the savage-being-feminised-by-a-good-guy theme (the other way round always works for me! 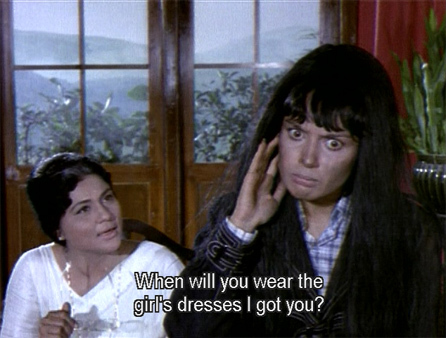 lol) but I still want to see it (I did like Aankhon Ankhon Mein inspite of Rakhee pulling off the same thing there). Rum: That’s a very unusual name! How did your parents come up with it? madhu: It’s impossible to find the music, I only have two songs from it. Asha is awesome and Navin very appealing. Great setting, story, etc. and not moralistic and judgemental either. Banno: Let me know what you think of it :-) Watch it with Dhanno! bollyviewer: Yes, he looks really nice in it. And he doesn’t really “feminise” Asha; she grows up a little through her love for him, but he doesn’t ask her to change, and in fact she doesn’t change much personality-wise. Still feisty! I think you’d like it. ajnabi: Forgot to say that this isn’t really a 60’s film—it’s technically a 70’s film :-) I was still half asleep when I commented earlier. 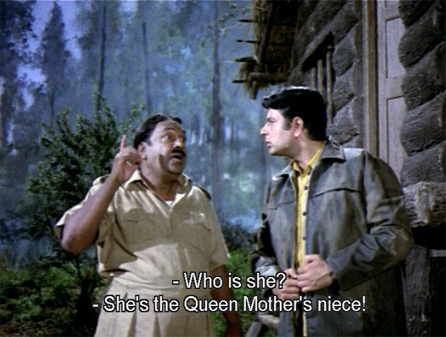 If you want to truly see some films from the 60’s, you could start with Jewel Thief and Teesri Manzil (or any Shammi film for that matter). He’s your basic “good guy”—a male version of the girl next door, but manly :-) There’s something so solid and respectable about him, but he’s cute too. And a good actor! The scene where he kisses Asha underwater is just fabulously romantic and he looks so pleased with himself as she goes off in a daze. 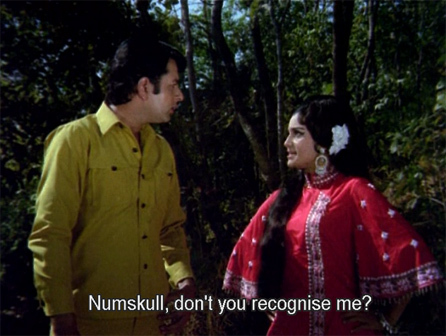 It’s been so long and I’m not quite sure which film occasioned it but I nursed quite a crush on Navin Nischol! And I like Asha too so thanks for the review Memsaab. Will definitely watch. I want to see that scene! In the first picture, I mistook him for Rajesh Khanna. There’s a slight resemblance in that profile pic. Aha. That explains it then Memsaab–the last comment from Amit! Incidentally, I’ve just discovered this stuff from Trader Joe’s which tastes almost like the Malpoa (Bengali dessert). For the edification of similarly deprived souls, it’s called (don’t laugh!) “Canneles de Bordeaux”. That screenshot with eyes all over the place after pigging out on faux Malpoa……! Amit: Hmmm, I don’t see it but they are also alike in that their acting is more understated than many. Suhan: Perhaps! The eyeball scene was disturbing even on an empty stomach. 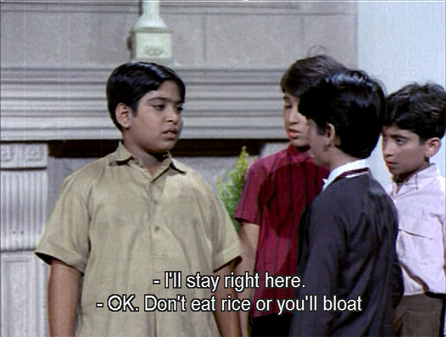 toonfactory: Give Navin another try; I won’t speak to the Vinod Mehra thing since I’ve not really seem him in much, although I think he was in Roti for about two minutes before Rajesh killed him. Nahin, Vinod Mehra nahin, Vijay Arora! Unless I’ve forgotten my Roti. Oops, now I see Suhan already corrected you on that. 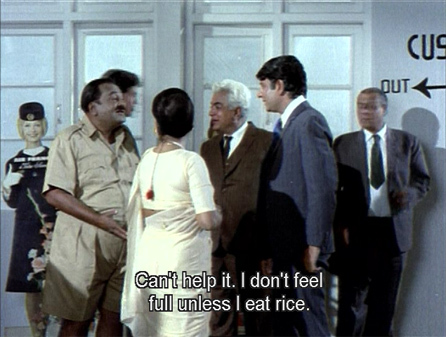 Memsaab, regarding Roti, it was Vijay Arora not Vinod Mehra. Vinod Mehra is the kind of person for whom the fast forward button was invented. I COULD NOT STAND him in RK and Shabana’ s Amar Deep for instance. Grrrr. Aaah! The source of my recent good fortune of Helen songs – if only I had read the post more carefully the first time around, I would have known to look sooner! And I LOVE that red coat Asha has on. Asha totally rocked this film. You should see it just for her, and Helen of course. I am reminded of another Asha Parekh film where she is a tomboy and Joy Mukherji is the hero. 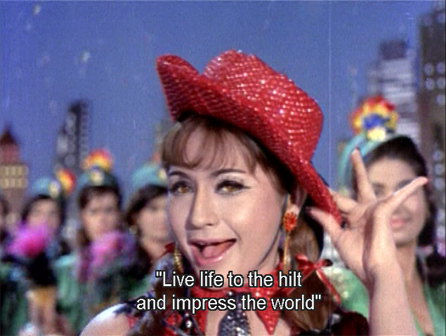 The film is called ‘Ziddi’ (1964). thanks, I’ll look for it! Memsab, I am sorry – I have never heard of this movie and neither the songs. But the story, going by your review seems very good. Navin Nischol is so handsome in this movie, it is a pity that he didn’t make it. It had to do with lack of star power may be. But yes he is extremely good looking. Asha Parekh in 1971 was looking older – she probably had some gynaec problems at that time – she had said something to that effect in an interview. 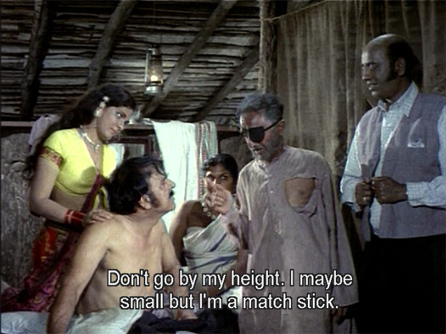 It was mean of Dev anand never to have utilised Rashid in any of his movies in the 70’S. Memsab, here is the list of 10 movies you should review.